Based in the UK, Alison Boots has been writing professionally since 2007. She has had work published in "Writing Magazine" and "Writers Forum" in the UK. She is also the editor and designer of a 16-page monthly magazine. Boots holds a diploma in holistic therapies from Thanet College in Kent. Lavender essential oil is extracted by steam distillation from the flowers and tops of the herb lavender (Lavandula angustifolia). It is considered to be one of the safest of all the essential oils used in aromatherapy. Lavender can be a great help to a pregnant mother, but it is a powerful oil and care should be taken when using it during pregnancy. It should never be used as a substitute for medical care, or without consultation with your doctor. Although lavender is classed as one of the safest oils, it is not recommended for use during the first 20 weeks of pregnancy. Says the website Expectancy: "Avoid using any oils in the first 3 months unless advised by an expert. Don't assume that, just because they're natural, they're automatically safe." Lavender is classed as an emmenagogue, meaning it may encourage menstrual flow, slightly increasing the risk of miscarriage. But in the later stages of pregnancy, lavender can be used to great effect. Stretch marks can appear in the later stages of pregnancy on the upper thighs and the abdominal area. To help prevent them, and to reduce their appearance, combine four drops of lavender with three drops each of neroli and mandarin oil in a carrier of 50 ml jojoba oil and massage gently into the skin daily. Lavender is one of the best oils to use to combat the daily stresses and strains of late pregnancy. 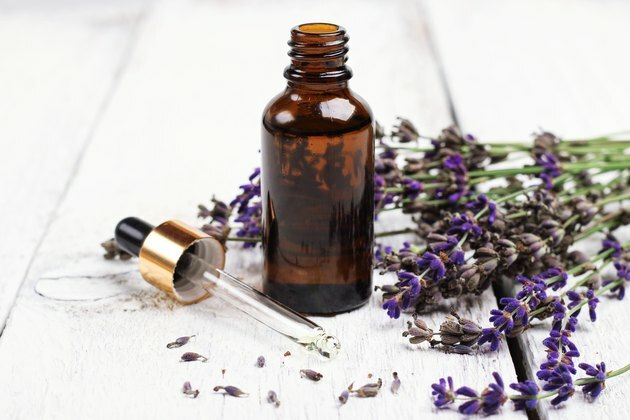 According to Esoteric Oils: "Lavender oil has a soothing and calming effect on the nerves, relieving tension, depression, panic, hysteria and nervous exhaustion in general and is effective for headaches, migraines and insomnia." To aid sleep, place a tissue with two drops of lavender oil on it next to your pillow, or add a couple of drops to a burner and place in the bedroom for 15 minutes before going to bed. Lavender can be a great help during labor, as both a calming oil and as a pain reliever. To combat backache, combine four drops of lavender with three each of Roman chamomile and mandarin oils in a carrier of 50 ml jojoba oil. Rub gently into the back to help relieve contractions. Warning: Lavender should not be used in labor at the same time as Pethidine, or epidural, or with Oxytocin/Pitocin infusions, as it may interfere with their function. Many new mothers may experience changes in the weeks following their baby's birth. In this postpartum period, some problems may include back and perineal pain, uterine cramps and fatigue. A 2017 study was conducted to determine the effect of lavender oil aroma during the postpartum period on maternal pains, mood and fatigue. Researchers found the use of lavender oil made a significant improvement in perineal and physical pain, fatigue, mood and distress. The conclusions, published in the International Journal of Preventive Medicine, were that mothers given lavender oil aromatherapy, started immediately after giving birth, had better physical and mood status compared to the control group. Read More: Are There Disadvantages to Aromatherapy?